Eleanor Oliphant is 30 years old, works in the accounts department of a local firm, carries groceries in a shopper on wheels, wears shoes with velcro fastenings and lives alone but for a houseplant to which she occasionally talks. She has a meal deal every lunch time and pasta with pesto for dinner every night, except on Fridays when she has a Tesco pizza, after which she drinks two litres of vodka from a Top Gear mug she bought in a charity shop and doesn't speak to another soul until Monday. On Wednesdays, she takes a phone call from Mummy, who is quite clearly psychopathic and intent on tormenting her daughter in grotesquely manipulative ways. But still, Eleanor's fine, of course. Completely fine. Eleanor Oliphant Is Completely Fine is a book about profound social isolation, the sort of isolation that can happen to someone even when they're surrounded by people all day. Is Eleanor lonely because she's so completely confused by social norms, or is she confused by social norms because she has simply never had sufficient social interaction to understand them? 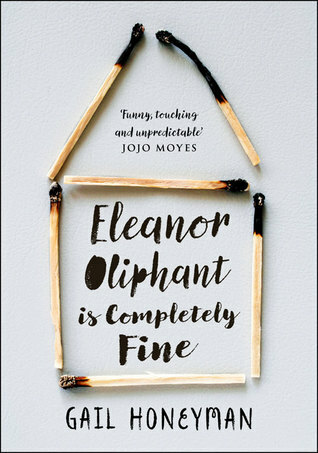 You could be forgiven for thinking this sounds like a depressing premise for a novel, but in fact, Eleanor Oliphant Is Completely Fine is often very funny. Eleanor, for the most part, is an engagingly matter-of-fact narrator whose off-kilter observations are sometimes surprisingly insightful while being simultaneously wildly off the mark. Moreover, she's almost entirely without self-pity, relating her story with a tragicomic stoicism that contrasts with her obvious fragility and vulnerability. That's not to say that this book isn't also extremely sad at times, but it's never sentimentally or manipulatively so. The story begins with Eleanor deciding that she has fallen in love with the singer from a local band and planning a course of action that she believes will result in them becoming a devoted couple. While Eleanor is busy executing this plan, she happens to be present at the scene of accident at the same time as her shambolic, chainsmoking colleague Raymond. Raymond insists that she help him call an ambulance to help Sammy, a man who has collapsed in the street, and somehow, this sets in motion a chain of events that introduces Eleanor to people and situations she's never encountered before. But can someone as profoundly damaged as Eleanor ever learn to lead a normal, functional life? Eleanor herself is an exceptional creation, through whose eyes you will see everyday occurrences from a completely different perspective. Despite the moments of darkness in this book - even some of the comedy is very black indeed and, as we start to piece together Eleanor's back story, there are some harrowing revelations - this is an ultimately uplifting and deeply touching book full of warmth and charm and one I thoroughly enjoyed. Lovely stuff, and a remarkable debut. Thank you to Harper Collins for providing me with a copy of this book via Netgalley, in exchange for an honest review.